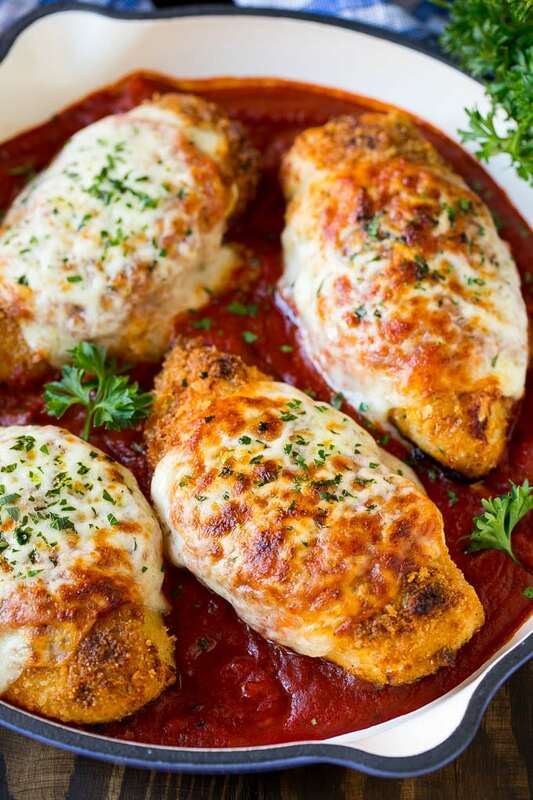 This baked chicken parmesan is golden brown crispy chicken breasts smothered in marinara sauce and melted cheese. A lighter take on the classic chicken parmesan that tastes like something you’d get in a restaurant! I love chicken parmesan but it’s often deep fried at my local Italian restaurants. 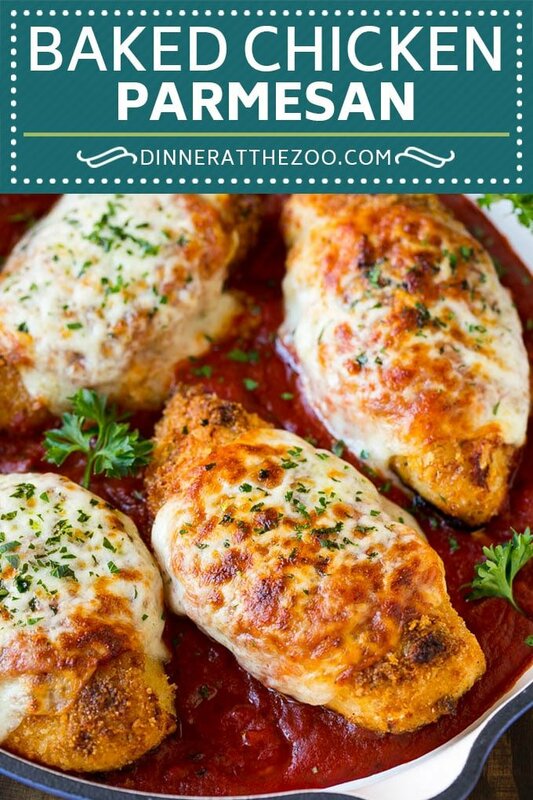 I make my own baked chicken parmesan that has the same great flavor without all the grease! Serve your chicken parmesan over pasta with a side of roasted broccoli or baked zucchini for a dinner the whole family will enjoy. Chicken parmesan is a classic dish that’s popular for good reason – how could anyone resist the combination of crispy chicken, marinara sauce and plenty of melted cheese? While I love chicken parm as much as anyone else, it can sometimes be a heavy offering since the chicken is often deep fried. This baked chicken parmesan is a little bit lighter of a take on this dish. It’s just as good as what you’d get at your favorite restaurant! How do you make chicken parmesan? This recipe starts with boneless skinless chicken breasts. You’ll want to use thinner chicken breasts, as the really thick ones will take a long time to cook, and your coating to meat ratio will be off. 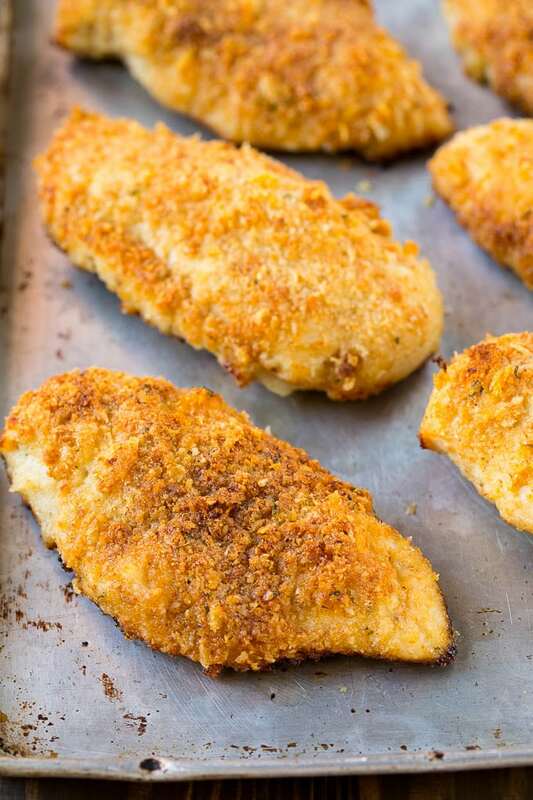 The chicken breasts are dipped in melted butter, then coated in a mixture of Italian breadcrumbs, parmesan cheese, panko breadcrumbs and seasonings. The chicken is coated with a little bit of butter and oil, then baked until golden brown. The finishing touch is a topping of marinara sauce and mozzarella cheese. Put the chicken back in the oven long enough to melt the cheese and you’ll be ready to eat. It’s best to use chicken breasts that are all approximately the same size so that they’ll bake at the same rate. You can add as much or as little sauce as you like to the chicken. I typically spoon a little over the top, then serve it in more sauce as shown in the photos. The sauce does make the coating on the chicken a little softer so if you like ultra crispy chicken, go light on the sauce. I typically use whole milk mozzarella cheese on top of my chicken, but you could also use a fresh mozzarella cheese or fontina cheese. You can garnish your chicken parmesan with chopped parsley or fresh basil, whatever you have on hand. I typically serve my baked chicken parmesan over spaghetti, which is the classic preparation. That being said, you can really use any type of pasta you like. 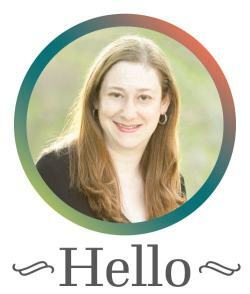 I’ve seen chicken parmesan served with penne pasta, orzo pasta or even a side of tortellini! I also like to serve a green vegetable on the side, such as roasted asparagus or steamed broccoli. If you’re looking for a full Italian meal, whip up a batch of garlic knots to go along with everything else. Once you try this baked chicken parmesan, you won’t want to go back to the deep fried version ever again! 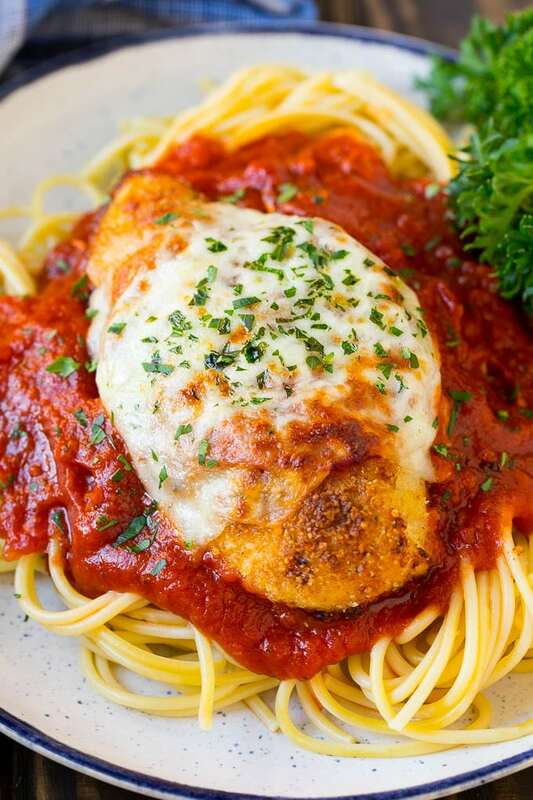 This baked chicken parmesan is golden brown crispy chicken breasts smothered in marinara sauce and melted cheese. A lighter take on the classic chicken parmesan that tastes like something you'd get in a restaurant! Place the butter in a medium bowl. Place the Italian breadcrumbs, panko breadcrumbs and parmesan cheese in a large shallow bowl and mix well. 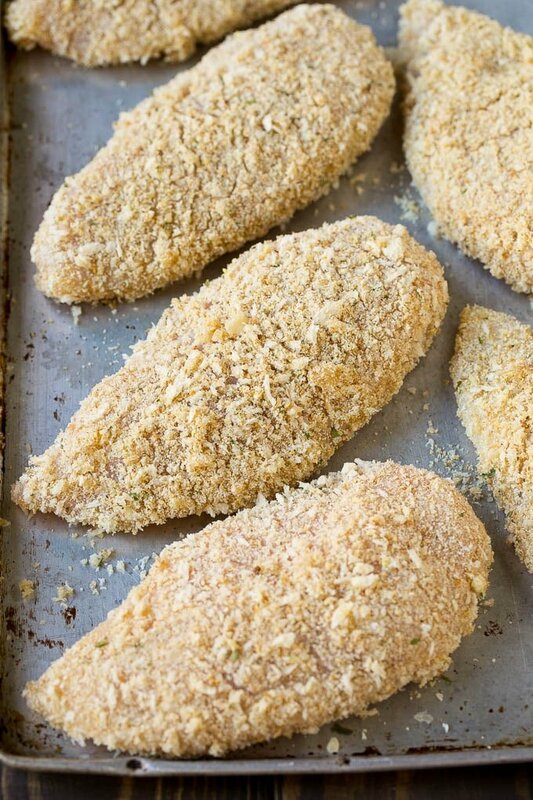 Dip each chicken breast into the melted butter, then into the breadcrumbs to coat evenly. Place each chicken breast on a sheet pan coated with cooking spray. Coat the top of each chicken breast with cooking spray and drizzle any remaining butter over the chicken. Remove the pan from the oven. 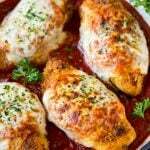 Place a few spoonfuls of marinara sauce and a slice of cheese on top of each chicken breast. Heat the broiler, then put the pan of chicken back in the oven. Cook for 1-2 minutes or until cheese has melted and browned. Sprinkle with basil or parsley, then serve. This looks like a yummy meal! We love making ours with the Tyson chicken and angel hair pasta with spaghetti sauce. Great recipe. I dont eat chicken anymore but I did love chicken parmesan when I did. This is a great recipe for pasta nights. Our boys love chicken parm. Great addition to our weekly menu. YUM! I love chicken parmesan and your recipe looks amazing. I am adding it to my menu plan for next week! Thank you. Chicken is one of my favorite meats to use. Especially in a dish like this! This looks easy and delish! I had the opportunity of having this dish couple of times and just loved it.Thanks for bringing back the memories. Baked Chicken Parmesan is really nice to eat. So yummy! I hope I can try your recipe. Thanks for the meal suggestion. I have to make some chicken parmesan again soon. This is one of my family’s favorite meals served over spaghetti! Yum. This will be on our dinner table tomorrow. This is one of my favorite dishes! I can’t wait to try your take on it!! This looks amazing! Too bad I only eat seafood….I wonder if I could swap out the chicken for shrimp or salmon maybe? You can substitute anything for a suggested protein in north of 99.9% recipes; I don’t eat red meat or seafood, thought I eat chicken/fish occasionally. Most of my protein comes from beans or various substitute meats. It is the sauce & Parmesan that is important here, put it on whatever you want (I suggest beans wouldn’t be suitable, but the Parmesan could be added on top as Italians do to serve). P.S. “I eat fish but not seafood”, for clarity, Brits generally mean seafood to be shelled things in particular, sometimes squid/octopus et. This is an American dish, not an Italian one, we don’t have it in the UK because Italians never brought it here – because they didn’t make it. It’s wonderful though, keep the sauce separate until serving if you don’t want soggy bottoms, I shall make this again soon.